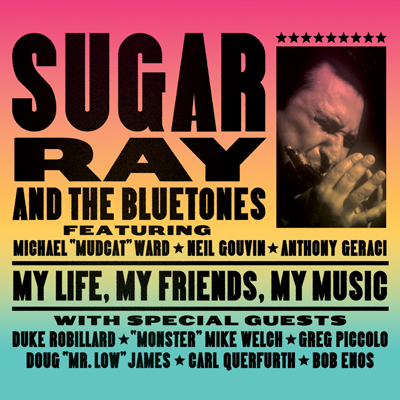 My Life, My Friends, My Music, Sugar Ray’s fourth release on Severn Records, is a mix of jump and Chicago blues all laced with Sugar Ray’s warm voice and harmonica. In addition to classics by Louie Prima, Sonny Boy Williamson and Dave Bartholomew, Sugar and friends create seven new originals. The album includes several guest appearances including Duke Robillard, “Monster” Mike Welch who split the guitar duties, Greg Piccolo on tenor, Doug “Mr. Low” James on baritone, Carl Querfurth on trombone and Bob Enos on trumpet. Check out Sugar Ray & the Bluetones other Severn titles: Rockin’ Sugar Daddy; Sugar Ray & the Bluetones Featuring Monster Mike Welch; Hands Across the Table; Evening; and Living Tear To Tear. There we were, one month after recording the CD you hold in your hand, in Sugar Ray’s yard at Christmas time. “The entire fleet is down,” stated Sugar Ray in that deeply resonant, familiar voice with which he also sings. This was not good news. All the vehicles were currently nonfunctioning. The storied Dodge van, used tirelessly to transport the band to a many a gig since the turn of the century, sat motionless between two tall pine trees. Under another tree, the usually trusty pickup truck having just been retrieved from the repair facility the day before, still refused to start despite all the new parts and assurances and over seven hundred hard-earned dollars having changed hands. The third strike, so to speak, was the khaki painted, World War II vintage, General Patton type Jeep, still in need of a major overhaul. Though it might be cajoled to run, it was neither registered nor inspected. Taking that roofless, windowless old timer out on the roads might create a legal maelstrom no one with any sanity left would court. And in keeping with the adage “when it rains it pours,” the twenty some odd year old Volvo wagon belonging to Sugar’s wife Patty had sprung a major fuel leak the previous evening. Forced to abandon it in Hope Valley, she called on her kind neighbor (known as “Neighbor” aka Dominique) for a rescue ride home. Sugar Ray was right, the fleet was down. Thank You…Patty, Jesse, Bubby, Clay and Lucy, Ken Graczyk, Jeff Aptt, The Geraci and Miller Families, Dennis Willmott, Sonny Jr., David Earl and Severn Records. “Little Green Talking Frog” is dedicated to Alberto and Maimoona.